Get Tax Lien Properties in Days, Not Years! Don't Grow Old Waiting to Get Tax Lien Properties! The main disadvantage to trying to acquire tax lien properties is the long wait that goes into a tax lien investment before a deed can be obtained. Some states have a redemption period as long as 4 years (the time allowed for the owner to pay off the lien). And, after the redemption period there is often a significant wait time for the deed to actually be issued by the county on tax lien properties. Then a quiet title action must be performed. It’s necessary before you can sell the property with title insurance. Also, you’ll find that over the course of the redemption period, most tax lien properties will indeed redeem (pay you off). You have a nice interest return no tax lien properties. I’m about to show you a way to get tax lien properties now, without doing any bidding, waiting, or investing your own funds to buy tax liens. Several years ago, while attempting to obtain tax lien properties myself, I noticed that 95% of the properties redeemed, and that using all my available cash I could only purchase 10-20 liens each sale. This meant that I only stood to get on property at the most from the sale. In fact, I never got any properties, all my liens paid off. At the same time, because there were hundreds of liens sold at the sale, indeed there were a couple dozen properties that were lost each year. The problem was, there was simply no way to know which tax lien properties would go all the way to deed, so you just had to get lucky with whatever liens you purchased. One day I was going over the final results of a tax lien sale that occurred the year before (there was a one-year redemption period which had just ended), and I was looking at all the lucky buyers that had acquired a property or two. There were actually some nice properties on the list that could have been redeemed for less than $10,000 that were worth over $100,000. It had been several months since the redemption period ended, and I thought to myself “I wish I had been on this owner’s doorstep right before the redemption period so I could have warned them – I could have at least given them some money for the property so they walked away with something!”. Then it hit me – why don’t I look at all the tax lien properties from this year’s sale, that could still be redeemed for the next few months, and start approaching all the owners who were about to lose their properties! I did just that. I looked up which liens had sold the year before, and crossed out all the ones that had paid off in the meantime. This gave me a short list of all the owners who were about to lose their property. The original tax lien properties list before the sale was over 10,000 properties. Of those, about 1100 sold at the sale and by the time I got the list 800 of them had paid off. So I had a prime list of 300 properties to really focus on over the next month. – Most of the properties were free and clear. I later realized that if a property had a mortgage, it was likely one of the 800 that paid off already because mortgage lenders redeem properties to save their own interest. – Far fewer of the owners were owner-occupants compared to mortgage foreclosures. Of those who did occupy the property, most had been given the property through an inheritance or other means. To this day I’ve never seen someone who spent 30 years paying off a mortgage and then allowed the property to fall victim to unpaid taxes. – Many of the property owners were deceased. I soon learned how to get deeds from the heirs and get instant title to the property. Most states have a “small estates” provision that will allow you to get good title to the property without a long, drawn-out probate. Since almost nobody outside the legal profession knows how to do this, you’ll have a tremendous advantage. 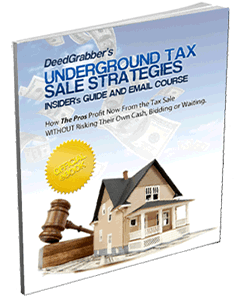 – All the properties that “fall through the cracks” end up at a tax sale eventually. Maybe someone was given a property they didn’t want. Maybe someone was sick of paying for repairs and taxes and just gave up being a long-distance landlord. Maybe family members moved into the house and were supposed to pay the taxes but didn’t. For whatever reason, tax lien properties are the most interesting source of pre-foreclosures you’ll ever find – and the profits can be immense. Best of all, you can get involved with little risk by either making a token payment for the deed to the property (in the case of someone who tells you they’re letting it go), or by getting the property under contract and flipping to another investor. Incidentally, investors trying to get their hands on tax lien properties through tax lien auctions are excellent people to assign contracts to – they are proven cash buyers who buy sight unseen, and you can get them a property now with no bidding or waiting, at a bargain price! What could be better? Profit From Tax Delinquent Property NOW! This little-known source of distressed property is the absolute best way to profit in real estate today. Why? 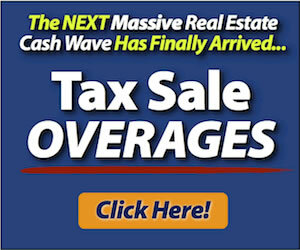 Most properties that are about to enter the tax sale process are free and clear! I'll show you why, and how to profit from them, in this free download! outdoor clocks for hospitals on County Tax Liens: A Good Way to Acquire Cheap Property? Best digital clocks on County Tax Liens: A Good Way to Acquire Cheap Property? Get Email Notification of New Content! Enter your email address below to receive updates each time we publish new stories!